Imagine the moment you walk into your wedding reception. You are in complete awe of its beauty. You see the design that allows your personality to shine and the smiles from each of your guests glowing back at you. Creating that moment takes some planning, but the outcome is definitely worth it! 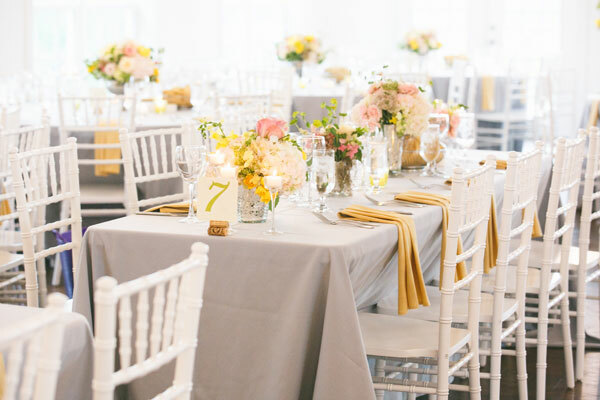 This post walks you through design ideas for tablescapes, color choices, centerpieces and place settings that uplift the ambience for an unforgettable wedding. When planning the style of your Washington, D.C. or northern Virginia wedding, decide on the grand picture of your design before getting down to the finer details. Find inspiration from your personal style and selected venue to choose unique centerpieces and exquisite place settings. Wedding style trends incorporate everything from bold, bright colors to soft, innocent textures. The design you pick should match your venue and vice versa. Let us walk you through a couple wedding design themes. Rustic Tablescape Design: Tousled bouquets of roses, hydrangeas and daisies create a cozy, summer feeling. 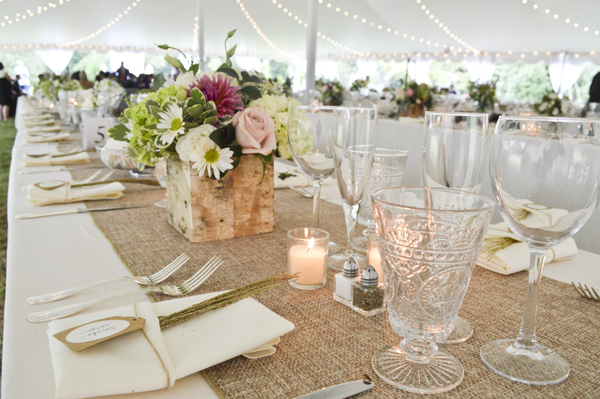 Mismatched chairs, chic glassware, country white linens and burlap finish the look. A venue like Riverside on the Potomac offers views of lawns, seasonal gardens, ponds, and a wooden barn that inspires a rustic design. 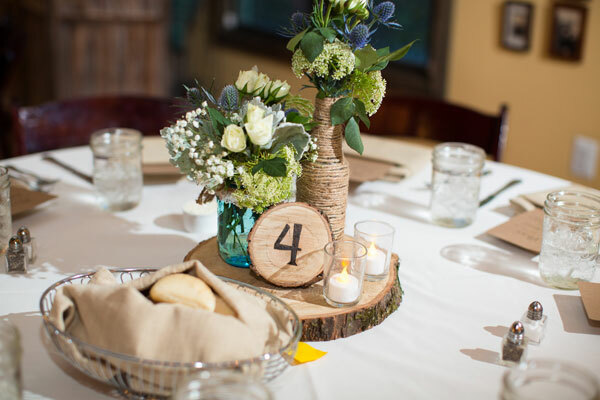 Woodsy Tablescape Design: Sprigs of greenery and baby’s breath sit alongside wooden signs for simple yet gorgeous centerpieces. The cozy, comfortable design will suit any venue with a nearby outdoor setting. 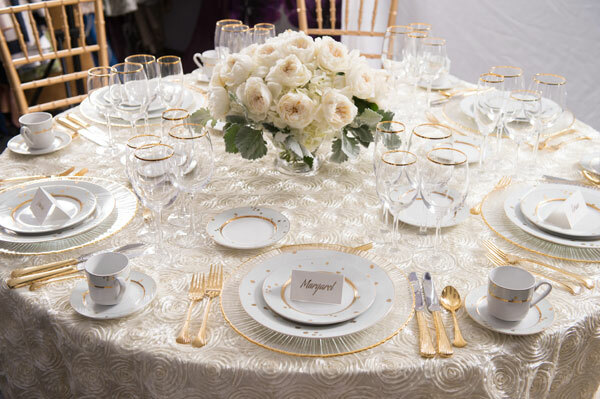 Elegant Tablescape Design: This look has a soft, royal tone. Think patterned ivory linen, gold-plated silverware, ornate dishes and pops of pink in the bouquets and napkins. Tall candles and table signs with beautiful cursive writing are also wonderful additions to this design. Modern Tablescape Design: Clean lines like those in the square plates are fitting in this modern design. 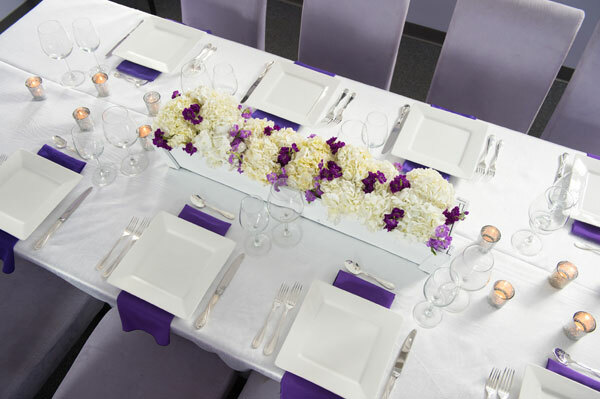 Dark colors like violet bring life to the clean white hydrangeas and tablecloth. 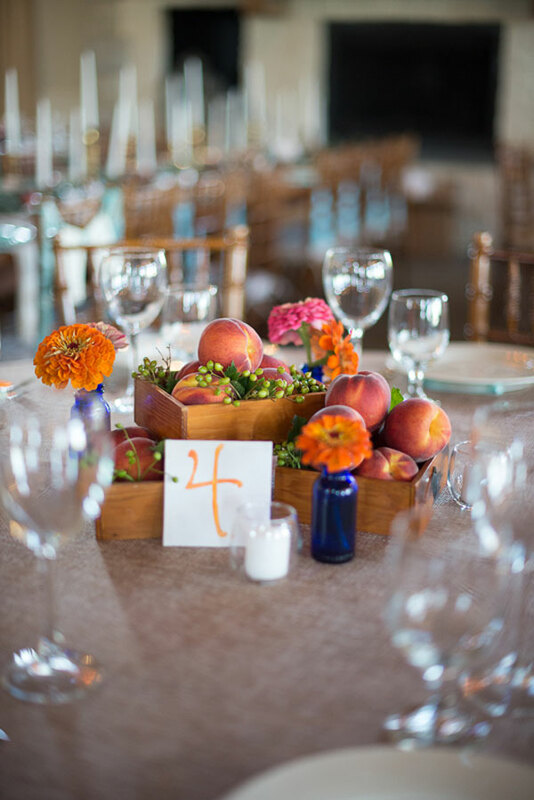 For example, modern table settings with bold colors offset the open space in a chic and contemporary venue like The Loft at 600 F.
Flower arrangements are always a popular wedding centerpiece, but we also love how some couples use original items like fruit and desserts as the table’s focal point. Stunning Flower Arrangements: Your favorite flowers and their fresh smells are welcoming decorations. From large to small bouquets, you can complete your wedding design with amazing floral tablescapes. Consider using varieties of bouquets throughout the space and reserve the biggest and most stunning arrangements for the couple of honor’s table. Tantalizing Fruit Centerpieces: Pears, peaches and oranges are not only making appearances in this year’s wedding cake flavors—They are also adorning the tables as unique centerpieces! Cupcakes: Enhance the entire dining experience with a centerpiece that doubles as a dessert. 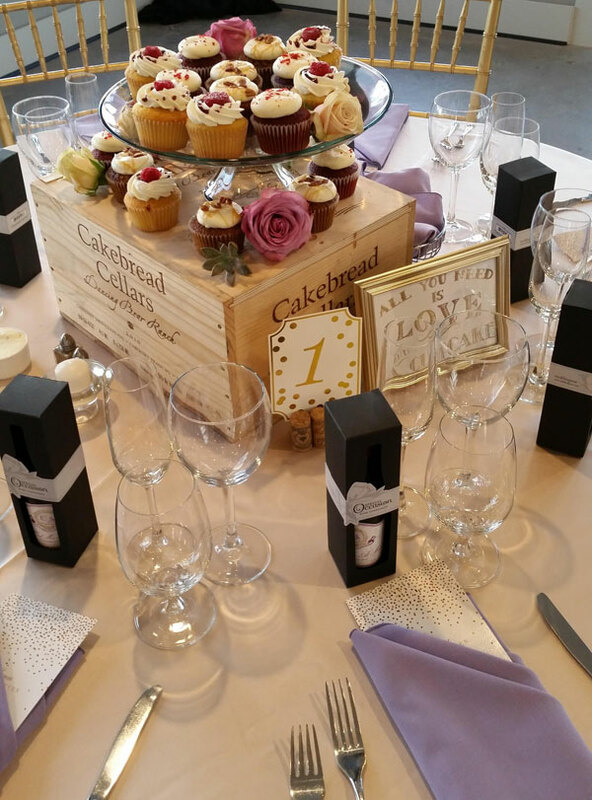 The cupcakes in your wedding centerpiece should have flavors that complement the main meal. For example, the rich flavors of a bittersweet chocolate base and salted caramel ganache filling express sweet elegance and romance, best paired with a red meat entree. A simple vanilla bean base with whipped buttercream icing and seasonal berries defines a casual, comforting wedding spirit. The flatware, plates and chargers you choose for your wedding tablescape will have textures, shapes and colors that bring the entire design to life. Be sure to speak with one of our Event Designers to find out which items are available. 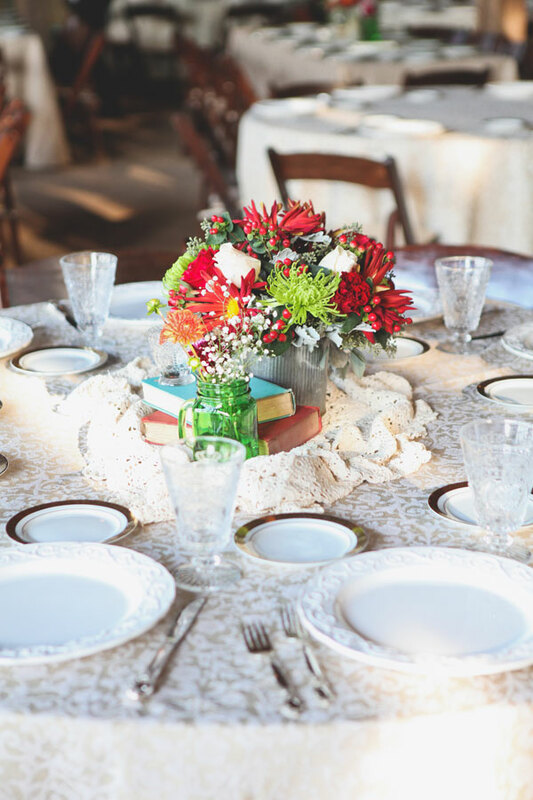 It may be worth renting certain items from one of our trusted vendors to create an unforgettable tablescape. Gold and brushed silver flatware can create a vintage or elegant look, depending on what you pair with them. Gold-rimmed plates and glasses are gorgeous accents, and plates with splattered gold polka dots add a cool, modern touch! 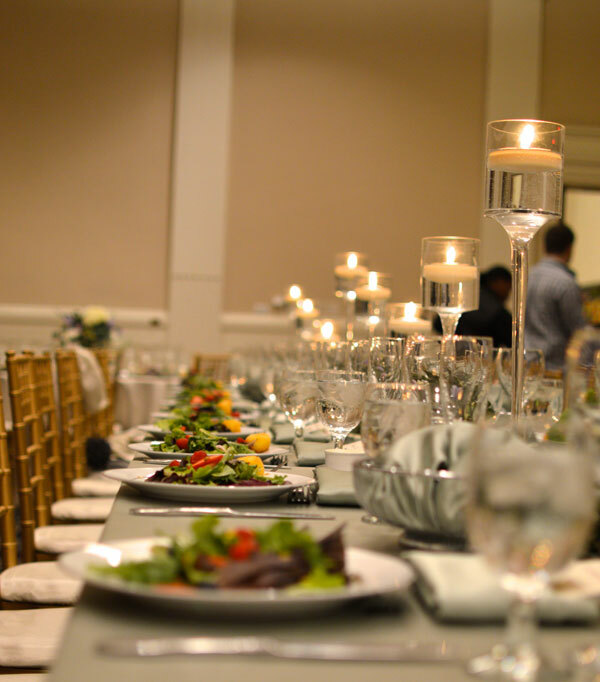 If you want your wedding tablescape design to highlight your personal style and venue’s unique features, the professionals at Purple Onion Catering Co. would love to speak with you. 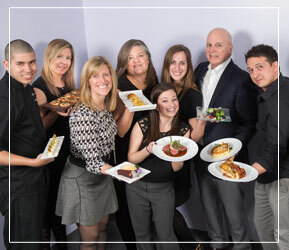 You can get in touch with our creative planners online or give us a call at (703) 631-0050.